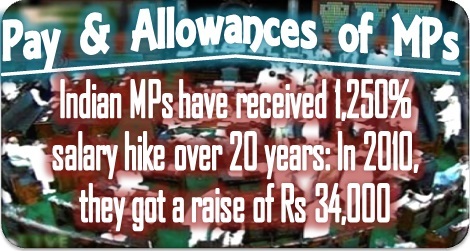 On Wednesday, Samajwadi Party Member of Parliament in the Rajya Sabha, Naresh Agarwal demanded a hike in salaries of Members of Parliament, adding that MPs earn less than their secretaries. News18 quoted Agarwal as saying, "Please include us in the Seventh Pay Commission. Our salaries are lesser than our secretaries.It looks like we are begging for money. We want an answer from the government. If they want to deny then they can. We want our salaries to be Rs 1,000 more than cabinet secretary." Interestingly, while commotion generally rules both Houses of the Parliament, there is an uncharacteristic unity seen between the Opposition and the ruling party when it comes to deciding on a pay hike. It was Agarwal who had brought the issue of pay hike last year after a Yogi Adityanath-led parliamentary panel suggested a 100 percent pay hike. The panel recommended that the salaries of the MPs be raised from Rs 50,000 to Rs one lakh. The panel also suggested the Parliament to double the amount in constituency fund from Rs 45,000 to Rs 90,000 and a 75 percent rise in pensions, NDTV reported. Ironically, Agarwal added that MPs deserve the hike given the good conduct of politicians in Parliament.While the Centre has given its approval for the hike in salaries, a formal bill is yet to be tabled in the Parliament to give effect to the recommendations. The last official rise in the salary took place in 2010, when the Parliament passed a bill to raise the monthly salaries of MPs from Rs 16,000 to Rs 50,000. Back then, there was a huge hue and cry over the MPs gifting themselves a three-fold pay hike. The bill had proposed to raise the daily allowance of members from Rs 1,000 to Rs 2,000 and the constituency and office expense allowances each from Rs 20,000 to Rs 40,000. It also sought to enhance pension of former members from Rs 8,000 to Rs 20,000 with effect from the constitution of the present Lok Sabha on 18 May last year. However, some of the MPs were not happy with the hike too. 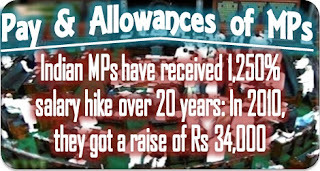 MPs like Mulayam Singh Yadav and Lalu Prasad Yadav had demanded at least a five-fold rise in the salaries.